A relatively new procedure at Methodist Estabrook Cancer Center is focused on the comfort and care of breast cancer patients with the smallest signs of disease. Known as I-125, this tiny “seed” is helping doctors pinpoint and remove areas of cancer too small to be seen or felt. “It’s just another option that can be a little more convenient for the patient,” said James Reilly, MD, a surgical oncologist at Methodist's Breast Care Center. He spearheaded bringing the procedure to Methodist. The I-125 seed is about the size of a piece of pencil lead. It’s implanted into a woman’s breast when there’s an abnormality that needs to be removed but is too difficult for a surgeon to locate without a guide. 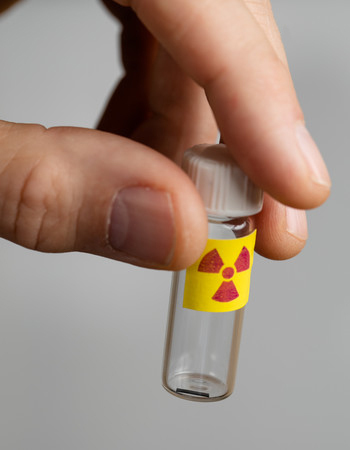 The seed contains trace amounts of radioactive material – less than a drop of iodine – which the surgeon can then locate using a special detector. Finding and removing the seed means doctors find and remove the cancer. The I-125 is considered a safe alternative to a procedure doctors still use to locate cancerous cells. Using a guide wire instead of the seed means two procedures must be scheduled for the same day, which can be an obstacle. From the provider standpoint, bringing the I-125 seed to Methodist was a collaboration between many teams – surgical oncology, radiology and nuclear medicine. Because of the radioactive material contained inside the seed, the implant must be tracked along its every move. Tracking and disposal of the seed follows all rules set forth by the Nuclear Regulatory Commission, even though the amount of radioactive material in the seed is minimal. “There are a lot of man-hours involved in governing these little seeds, but there is a huge patient benefit, and that makes it all worthwhile,” Brennan said.